What to say about Michael Bradley. I really shouldn’t have let myself get stuck with writing this one as it should be full of good things, but I just can’t bring myself to like him. I obviously don’t know him as a person beyond his footballer personality, but that ‘ooh, look at me, I’m so intense, I’m such an inspirational leader’ footballing personality that he has and that the media happily glorifies continues to rub me the wrong way. It really really did back in 2014 when things were going pear shaped (see the game in New Jersey when he petulantly got himself booked and suspended for the nadir of all that) and I’ve found it hard to warm up to him since then even though the club’s doing well and he’s clearly been a big part of that. The US failing to qualify for the world cup is hilarious, and though I feel a bit bad for Jozy, Michael Bradley failing to qualify for the world cup amuses me just as much, and the fact that the self hating Americans chose him to direct their booing at was another fantastic little cherry on top of both their failure and TFC’s success. While still on his personality, I did enjoy how after the MLS Cup final, amidst the celebrations, walking round the pitch with his kid, and the kid picked up a corner flag and was walking with it. Bradley noticed and walked the kid back and made him put the flag back, which made me laugh. Good Dadding. But then think of the parade, did he look at all drunk? Not compared to others he didn’t. I guess his dedication to partying isn’t as intense and leadershippy as it should be. He could learn something from Jay Chapman there. Anyway, he obviously had a very good season this year, playing a big big part of the success, even if he didn’t score any goals (though the one against Mexico for the US was very impressive). The referee baiting that he and the team as a whole indulged in way too much kind of belies the whole ‘disciplined professional, inspirational captain everyone should be emulating’ hype, but aside from that, it’s difficult to criticise. He had a very settled position on the pitch, and seemed to be cured of his desire to do too much and so it all worked very well. Plugging up the midfield ahead of the centre backs, and pretty much always starting the moves going in the other direction, that whole ‘general’ nickname seemed quite appropriate. He had a very good playoffs as well, doing a lot of good things and making a lot of important interceptions, tackles, desperate chasing down of long balls and getting there just before the attackers, all that sort of thing. I’m fairly certain he got consecutive man of the match consensus klaxons from the VMP in the 2nd leg against Columbus and the final, which both felt very grudging, but he undoubtedly deserved them. So yeah, good player, happy to have him on the team, will particularly enjoy watching him play for TFC throughout the World Cup next year, but I just can’t bring myself to like him. I blame the media. Too much fawning makes it hard for me to appreciate him on his own terms which I might well do if I didn’t have to read through all the adulation. To sum up, very good player, but would it hurt you to relax a bit? I’ll end this by again turning it over to our American friends. Tony: 1 – Yes he makes a ton of cash in a position that doesn’t in this league but there is no doubt who actually lead this team one step further. We used to have a laugh at “The General” hyperbole but Bradley turns out to be the kind of captain who moves a club forward in the locker room and backed it up with some outstanding playoff performances. Kristin: 2 – I almost had him in the first spot – no really – but for one other player’s performance he would have been. The last two seasons have been quite the evolution for Bradley and this year was his best. This season he really focused on the defensive/distribution side of his game and with VV to handle the attacking side he was able to break up plays, set up any number of tasty passes and more. He took his fewest number of shots, scored no goals, mixed it up (receiving his highest total of yellow cards – 8 – not always my favourite thing), and determinedly led the team throughout their record setting season. His playoff performances really stand out though; I said much the same last year, but he was truly outstanding in the post-season. It’s taken four years but I think I’ve come around – he’ll never be my favourite player but I’m pretty happy that he’s on our team. Mark: 3 – He’s been good and he’s been absent, but he’s been amazing in the playoffs. Not that I could see his contributions on the pitch all of the time, as the season went on, it became clearer that he is the leader on the pitch. Susan: 1 – He was a beast all season! MarkHSV: 2 – I almost chose Bradley as #1. He was so focused on winning it all this year. No worrying that he needed to step up and ignite the offense. Just shut things down through the midfield all season and helped out the defense massively. I really wanted to give him #1, but there is one more player that just seemed to change everything for TFC this year. Aron: 4 – I was trying to think of something to say and while thinking I dropped him down a spot. So no more thinking. Jen: 4 – If I had kids, I’d raise them to be Michael Bradley. James: 1 – As goes Bradley, so goes TFC. It is rare to see a player whose sheer force of will so entirely inspires and drives those around him. He is not the only one responsible for the attitude, that day in, day out willingness to work, to go for every point, every trophy, but he is a large part of it. It has gone largely unnoticed here, but a colleague from out of town pointed out that some of the more recent arrivals have even taken on Bradley’s mannerisms and speech pattern, that calm, direct, thoughtful, yet stern determination; the accent of uncertain origin. Two things that Bradley has said over the season come to mind. The first was something he, more-or-less, said of Altidore: that when the players line up in the tunnel, looking over at the opposition before kickoff, he knows that with Jozy there will be a modicum of additional fear that settles in. One suspects that Bradley is the ultimate weapon in that regard. Any one who squares off against him must know they are in for a tough day. And the other was something he said repeatedly as the playoffs loomed and continued: that on the biggest days, with everything on the line, that is where he wants to be. He made that clear in the MLS Cup Final where he was imperious, driving the side to glory. The role of captain can be a nebulous thing. It is not where Bradley is concerned. Martyn: 3 – Captain that bossed and bullied and kept his head (what????) when others around him did lost theirs. His last two matches give me chills. Best 0 goal season in history. Steve C.: 1 – Without Bradley we don’t win the cup, but without Victor Vazquez we don’t win the league – so I have them tied at 1. TweetKred: 1 – The general created the mindset for the entire team to follow “Good teams find a way to win” he said and personified this. 1% of the field is covered by painted lines, the rest is covered by bradley even when Under Pressure. Just a pure destroyer of opposing offence and then immediately into attack. Easily the MVP of the final and the year. Ruchesko: 8 – Improved in the post-season. Was he humbled by the loss to Trinny & Toby, or has Gulati tapped him to ghost-manage the USMNT? Mel: 1 – There is not enough space to properly explain why Bradley is ranked number 1. So all I’ll say is he is the best there is, the best there was, and the best there ever will be. TuffyRocks: 4 – Finally has found his role in the middle and as long as he stay there he will continue to be excellent. JordyLike: 6 – He’s that guy your friends hate but has never let you down. Expect I’m not friends with anyone who supports the US men’s national team, so he’s more like that guy that you and all your friends like and is great and bald and beautiful. Sad to see him eventually, inevitably, go to LA. Alex: 3 – Despite the WC disappointment, showed leadership and cemented himself as a world class midfielder especially in the playoffs. ZicoZay: 1 – Amazing 40 – 50 yard game saving runs to close down opponents. Jeff: 1 – If you have to ask why I don’t even want to talk to you. He revels in the sh*t that most players find an annoyance- i.e. the small stuff that wins games that never make the stat sheet – ultimate captain. Steve G.: 2 – The team’s heart, the team’s engine. This is all true. 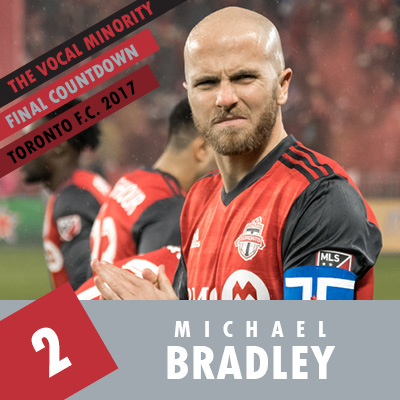 Michael Bradley and his ability to cover massive amounts of ground and his decision to move to the 6 from the 8 and become a legitimate holding midfielder instead of a creative midfielder or a box to box player has had the largest impact on the team’s success over the past two seasons. more than moving to 3-5-2. More than adding any single player. Bradley is the key to this teams long term success on and off the field. Artur: 1 – The backbone of the team. Main reason for having one of the best and most organized defense in the league. Mr. Tuktoyaktuk: 3 – Like Jozy A, some people (cough, USMNT supporters, cough) have a mental picture of how he should play and he rarely matches that definition. The critical things he does aren’t often are related to technique but are noticeable when he is absent. He is the Dark Matter of TFC. YellingAtSoccer: 3 – Was everywhere, did everything.